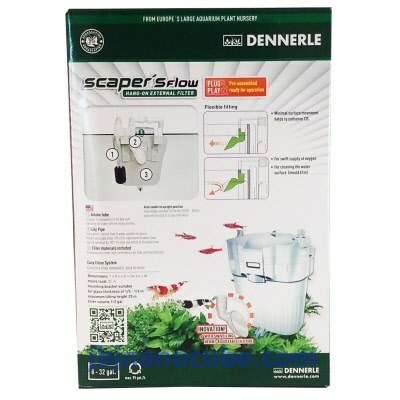 The groundbreaking Scaper's Flow Hang-on External Filter is impeccable for aquatic plants and shrimp. 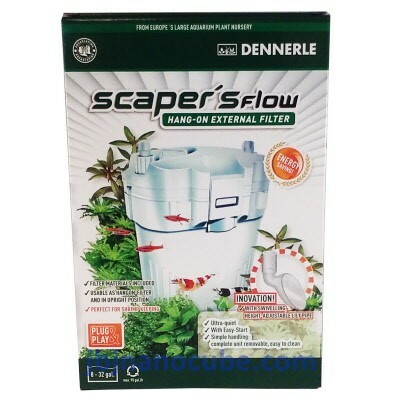 This new canister filter will keep your 8G – 32G aquarium crystal clear. - Filter includes a vertically adjustable and rotatable lily pipe: Vertically adjustable (max. 10 mm) to change with the water level. Rotates through 180° for best placement of the water flow. The newly developed lily pipe meets all the requirements: Daytime position: the lily pipe outlet is totally underwater if the filter is joined to the bottom catch. This pipe also makes a mild, natural, plant-friendly water flow due to its fanned out shape, and it also supports moderate gas exchange. As a result, the CO2 required by plants is not excessively driven out. Nighttime position: the lily pipe is not entirely immersed if the top clip is raised. This creates a small whirlpool that eradicates any possible mold deposit and introduces extra oxygen into the water.